A fun and fruity cookie, this twist on traditional apple cobbler brings a warm and tasty cookie recipe you’ll love! 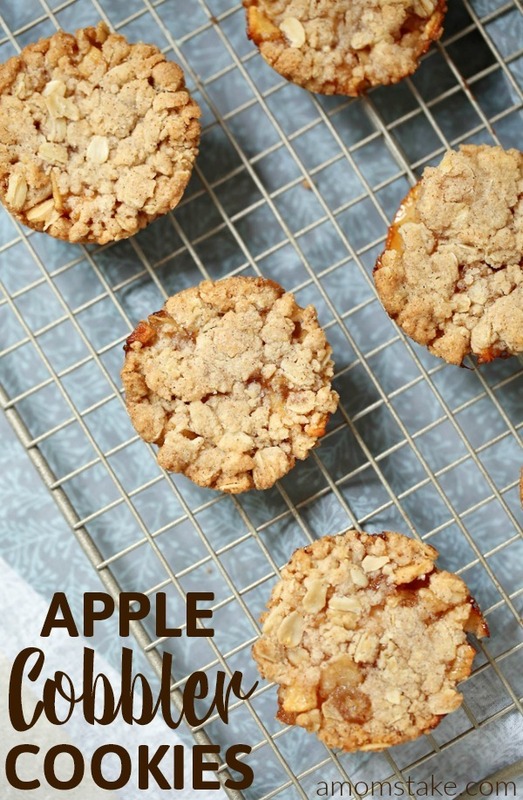 These apple cobbler cookies have a warm crumbly topping and sweet fruity inside. Ever wanted the warmth and yummy taste of sweet apple cobbler, but without a whole pan full you’d be tempted to eat? 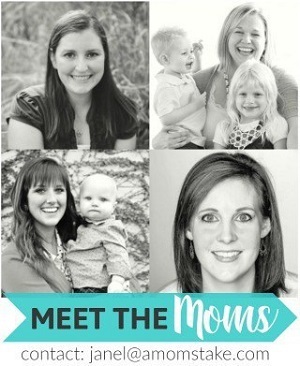 This twist on the favorite classic is an exciting new option! 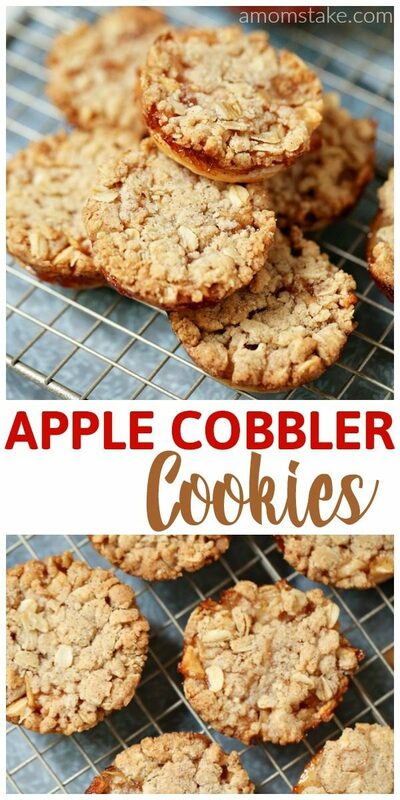 Instead of a full pan of apple cobbler, try these yummy cobbler cookies instead! You’ll start by prepping your apples, dicing them into small pieces. 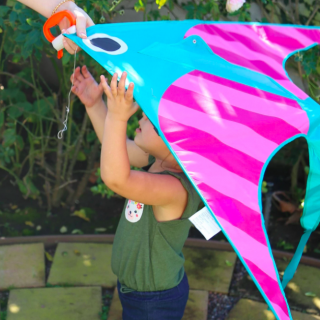 Aim for 1/2″ or less squares. 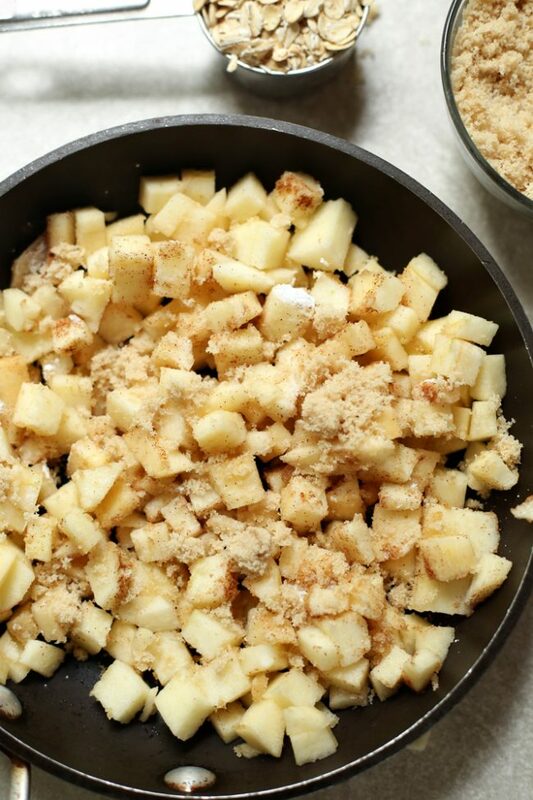 Saute the apples with brown sugar, cinnamon, and corn starch over a medium-high heat for 8 minutes, or until soft. You’re making the sweet cookie filling in this step. Now, roll out your pie crust into a thin and flat layer. Cut out circles using a small circular cookie cutter so they will fit perfectly inside your cupcake or muffin tin. Put on pie crust into each cavity of your cupcake pan. Layer a smalls coop of apple pie filling onto the top of your pie crust circles. 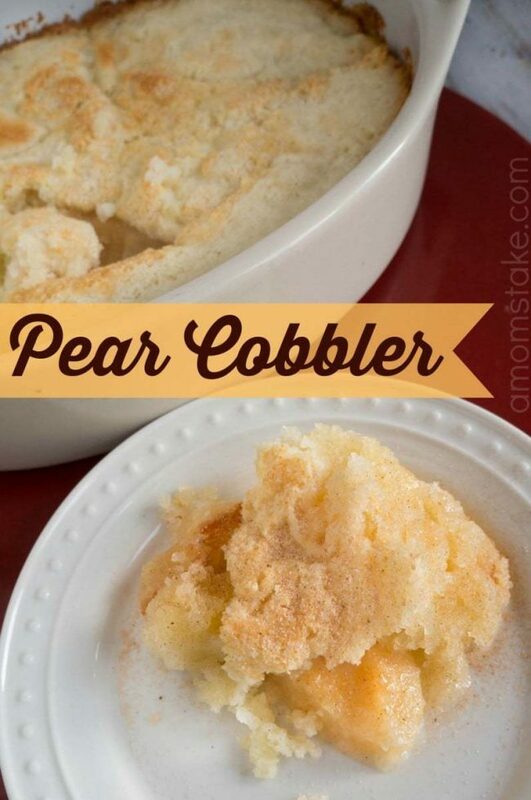 Combine flour, brown and white sugars, oats, and melted butter to create your crumble cobbler topping. Sprinkle a spoonful of topping on top of each, lightly pressing the crumble flat. Bake at 350 degrees for 20 minutes, or until the topping is golden brown and the apples are bubbling hot! 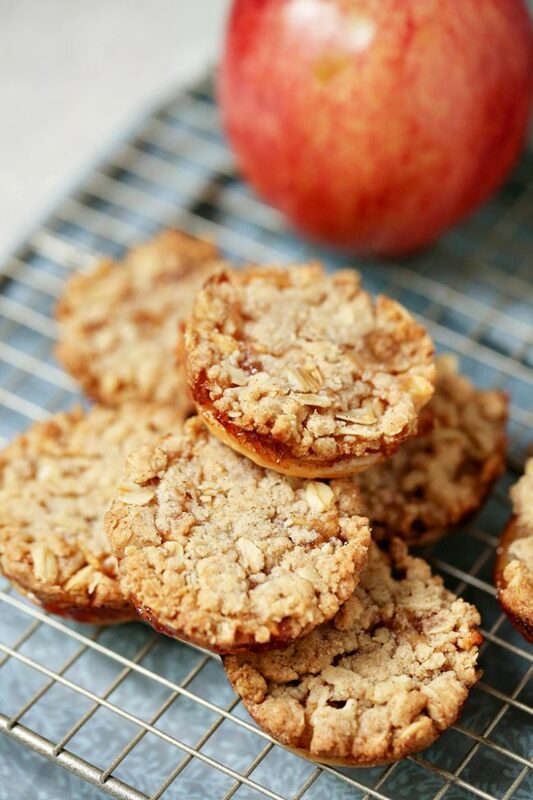 Watch us make these yummy Apple Cobbler Cookies in this quick 1-minute video! A fun and fruity cookie, this twist on traditional apple cobbler brings a warm and tasty cookie recipe you'll love! 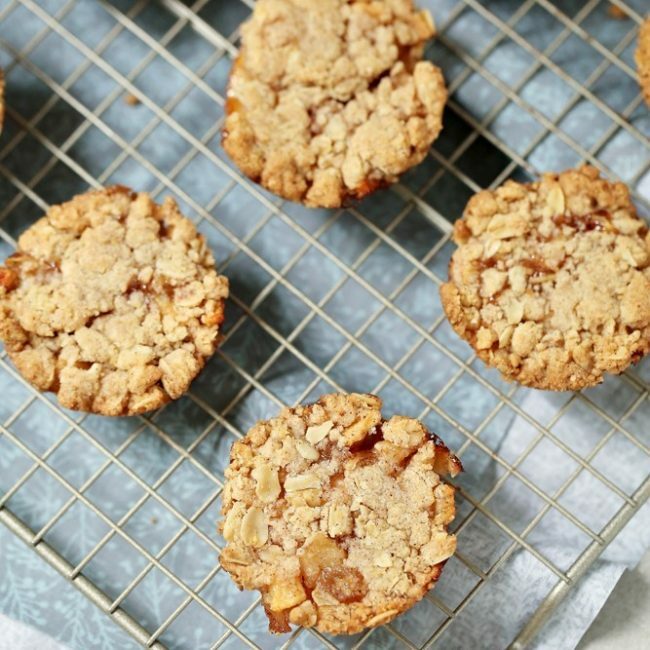 These apple cobbler cookies have a warm crumbly topping and sweet fruity inside. Dice apples. Cook in a saute pan with brown sugar, cinnamon, and cornstarch over medium-high heat for 8 minutes or until soft. Roll your pie crust flat, and cut circles out using a small cookie cutter or lip of a cup so that they are the same size as the cups in a muffin tin. 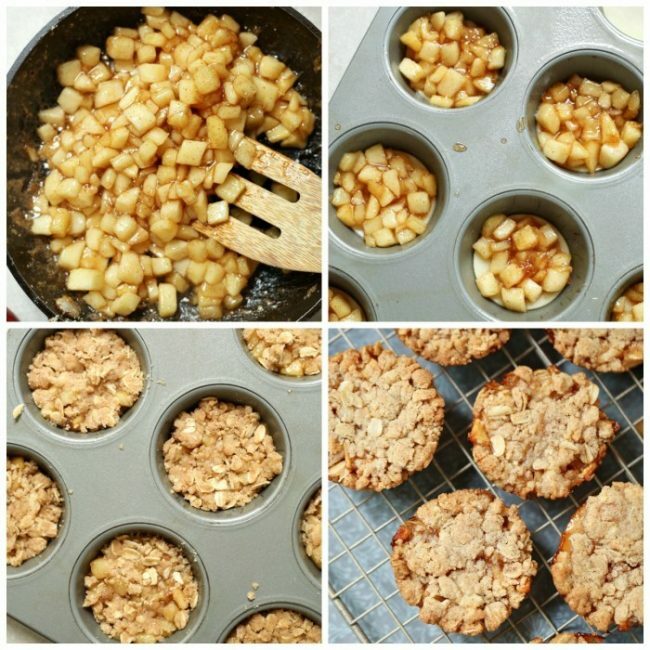 Place each circle in the bottom of a muffin cup, then top each one with a spoon full of apples. Combine topping ingredients, until well combined and ingredients are moist. Top that with a spoon full of your topping mixture, and press lightly so that everything is flat. Cook at 350 degrees for 20 minutes, or until topping is golden brown and apples bubble. Try one of our other yummy recipes, next! 3-Ingredient & 5 Minute Peach Cobbler with Cake Mix! These cookies look beyond delicious! 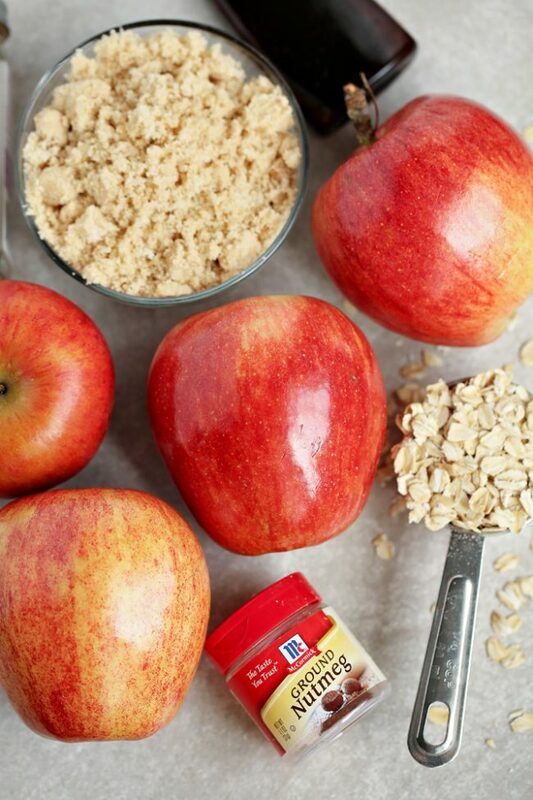 Apples remind me of fall and I think this recipe would be a wonderful way to kick off my seasonal baking adventures. Bookmarking this for this fall when apples are in season here! I’ll like these much better than apple pie! 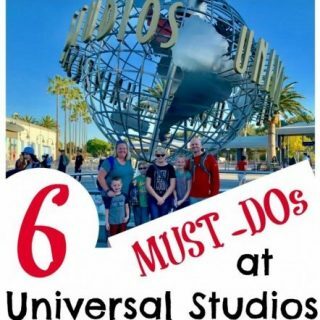 Okay… this looks too good to be true!! Gonna have to try these. 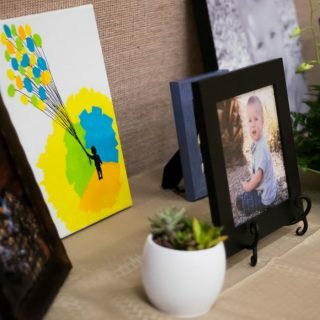 Also, great use of photos. 🙂 Very pinable. Oh my, these cookies look amazing and perfect to bake in the Fall! Thank you for the recipe!